The Schiehallion Single Ventile® Jacket is designed for windproof and light shower proof use. The design draws on traditional styling from the cagoule era, it's virtue is in its simplicity. The Schiehallion offers excellent weather protection and durability as well as a 'no frills' style. It packs away easily and is lightweight. The Schiehallion features an integral hood with volume adjuster, velcro closure cuffs, front storm flap with velcro closure and large pockets with storm flaps. This jacket is named after Schiehallion - in English "Fairy Hill of the Caledonians' - the well known mountain in the Scottish Central Highlands where contour lines were invented as part of an 18th century experiment to determine the mass of the earth . Find out more in our Glossary>. Comfortable and with low rustle, it's an ideal jacket for walking and nature watching. 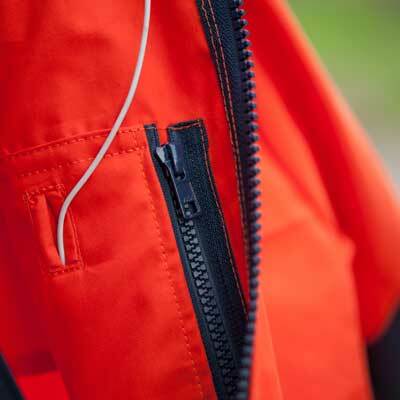 See the Braemar Smock for a single Ventile® Smock design and the Talorc Jacket for a Hybrid Ventile® solution. Thank you for your review Mr Bell. We will review the design based on your comments. As regards waterproofing, the Schiehallion is made from Single Ventile therefore not fully waterproof. It should however keep you dryer than synthetic windproofs.